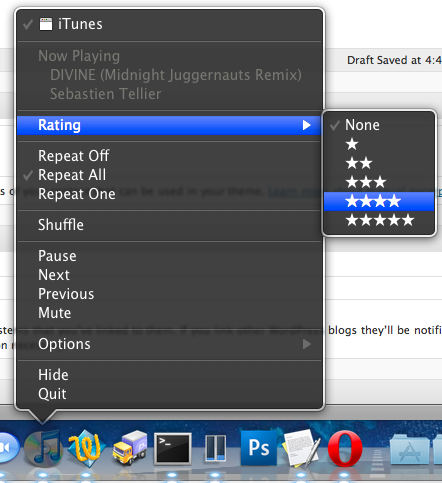 You can rate iTunes songs directly from your Dock in Mac OS X! Just right-click (or control-click) the iTunes icon within the Dock, and scroll up to ‘Rating’, this will open up a submenu and from there users can select the Star Rating they want to assign for the song that is playing. This is great if you use playlists based upon ratings, or if you’re listening to a large playlist or iTunes library of tons of songs that you’re unfamiliar with, or maybe you just like being a critic, that’s ok too. This should work in all versions of iTunes and all versions of Mac OS X. Keep in mind that you must have the song playing from a local library to get the ratings, and you can’t rate songs streamed over the internet or from iTunes Radio sources.